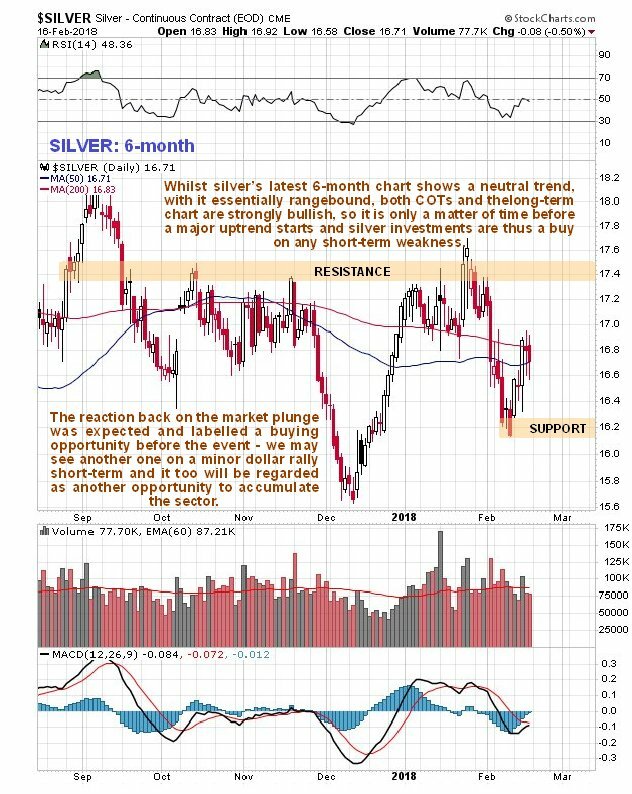 Silver is completely “off the radar” for most investors right now which is just the way we like it when we are buying, however, as we will see, there are good reasons to believe that this will not be the case for much longer. On its latest 8-year chart we can see why silver has zero appeal for momentum traders now – it ain’t goin’ nowhere, or so it would seem, if you project past performance into the future, but as we have repeatedly observed in recent months, it is marking out a giant Head-and-Shoulders bottom, which is quite heavily disguised compared to the concurrent flat topped H&S bottom forming in gold, because it is downsloping. A key bullish point to observe on this chart is the steady volume buildup over the past 2 years, which is a sign that it is building up to a major bullmarket. This hasn’t had much effect on volume indicators so far, but such is not the case with gold, where a more marked volume buildup has driven volume indicators strongly higher so that they recently made new highs, which bodes well not just for gold, but obviously for silver too. Moving on to observe recent action in more detail on the 6-month chart, we see that silver dropped back further than predicted in the last update, which is hardly surprising considering what happened to the broad stockmarket. No technical damage was incurred, however, and it has already clawed back a part of the loss. What now? – like gold, silver may drop back again short-term on another modest dollar rally, which appeared to have started on Friday, and any such drop will be viewed as presenting another opportunity to accumulate more silver and silver related investments, especially given silver’s latest COTs which are “flat-out bullish” as we will now proceed to see. 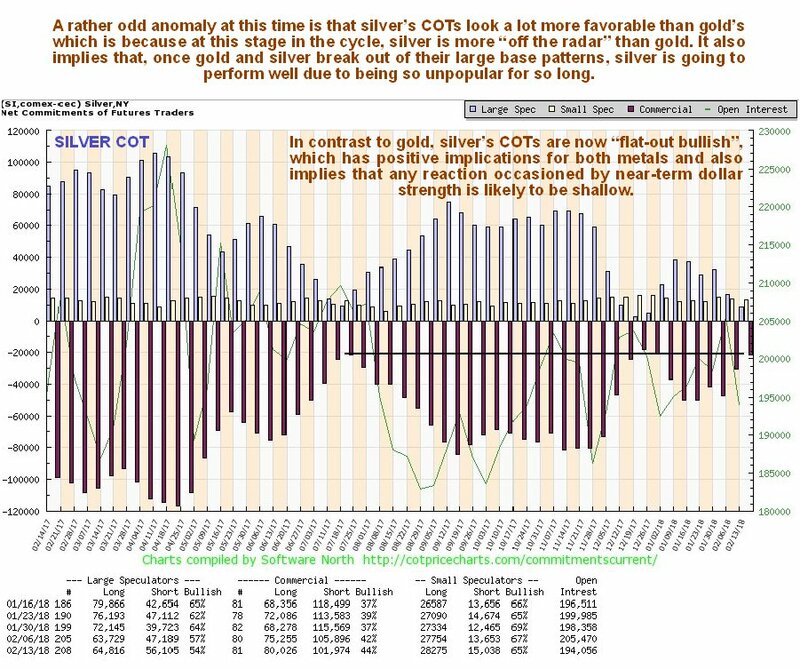 The latest COTs show that the Large Specs have “thrown in the towel” on silver and gone home – great! – that’s what we like to see. This extremely low level of Large Spec long positions is very bullish indeed for silver and also implies that gold could soon rally too, despite its COTs not being so positive, although as mentioned above both metals are likely to have to weather a modest dollar rally first. 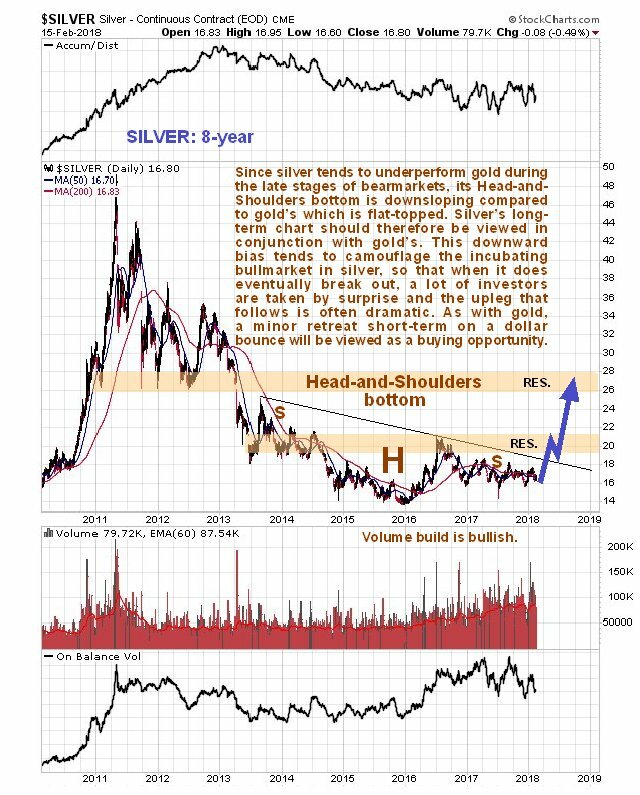 In summary, whilst a minor short-term dip on a modest dollar rally looks likely, silver’s chart are very bullish overall as it appears to be readying to break out of it giant Head-and-Shoulders bottom. Any near-term weakness will therefore be viewed as presenting an excellent and possibly final chance to accumulate silver and especially silver stocks at very low prices ahead of major sectorwide bullmarket commencing.